I’m not going to lie, when I was on my way to Children in Crossfire for the first time, I had no idea what to expect. All I was aware of was that they were a charity, a successful one at that, and they helped children in need. I was thinking to myself “it’s going to be a depressing environment with even more depressing people.” What I know for sure now is that I was 100% wrong. Although when I arrived the heating wasn’t working very well, I was greeted with a very warm welcome. I was made a cup of coffee, something that my own mother debates doing for me nowadays. I could instantly tell that everyone had a very close bond with each other, and I loved it! My first day went something like this: I did some stuff on a laptop, wrote some things on envelopes and packed some things in folders. It was the same type of things each day, which is what you’d expect for a work experience student like myself. However, for me, it wasn’t what I was doing, but what I was learning about Children in Crossfire while I was there. It’s incredible! They do a lot more than I thought. For example, they’re currently operating in Tanzania and Ethiopia. In Tanzania, 37,000 children across 120 schools have improved pre-primary education and in Ethiopia over 1,500 families in 4 vulnerable communities were provided with access to safe water. This is just a fraction of what they do in these countries. The main reason all this happens is because of Richard Moore, the founder of Children in Crossfire. His story is truly incredible and inspirational, but unfortunately it’s too long to speak of here, but is definitely worth learning about. My father has a personal bond with Richard, which makes this whole experience even more superb than it already is! It’s because of Richard that this charity is unique, and is more than worth donating to. 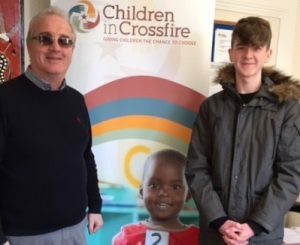 Trust me, donating to Children in Crossfire could change you as a person, but will definitely change someone else’s life who is currently living in poverty and extreme conditions. You could help Children in Crossfire achieve their goals for the future, for example, training 30 pre-school teachers to provide quality pre-school education to over 1,000 children in Wolisso, Ethiopia. So what are you waiting for? DONATE!